His latest act? Thinking it was a great idea to take his Mustang out for a rip on an active airstrip. As if it was an episode of Top Gear or something. 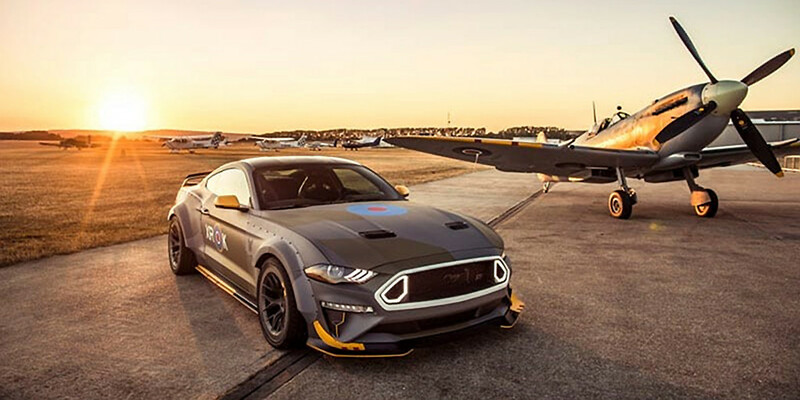 Or a photo shoot with the RTR Eagle Squadron Ford Mustang, and matching Spitfire WWII plan, as seen above. According to a Fox News report, Florida police arrested Zane Alexander Carlson on January 30, after he broke through an airport fence while driving his Ford Mustang. He then proceeded to drive down the airstrip at approximately 100 mph. After clocking triple digits he continued his fun by doing some donuts in the grass adjacent to the runway. Finally, he drove into a hangar and proceeding to do even more donuts until the police arrived. The Drive says that police don’t believe that alcohol was involved, which makes us think that it was all just for kicks. Police think that Carlson “just felt like driving down a runway,” according to Mike Wood of the Pensacola Police Department. Police have also ruled out terrorism as a motive. Carlson is, however, very much in jail after being arrested on suspicion of trespassing and criminal mischief. Maybe he thought that he was Vaughn Gittin Jr in the Eagle Squadron Inspired Ford Mustang GT? We’ll probably never know, but it either way, it sounds like a lot of fun. Subscribe to Ford Authority for more Mustang news, and any other crazy ‘Florida Man’ stories involving Mustangs.